Purpose: To maximize performance in fast growing baby calves. The proteins in this formula are derived exclusively from milk products and are easily utilized by the calf. Dried Whey Product, Animal and Vegetable Fat (Preserved with BHA), Lecithin, LLysine, DL-Methionine, Vitamin A Acetate, Vitamin D3 Supplement, Vitamin E Supplement, Ascorbic Acid, Choline Chloride, Vitamin B12 Supplement, Menadione Sodium Bisulfite Complex (Source of vitamin K3), Niacin Supplement, Calcium Pantothenate, Pyridoxine Hydrochloride, Riboflavin, Folic Acid, Thiamine Mononitrate, Biotin, Calcium Iodate, Choline Chloride, Calcium Carbonate, Dicalcium Phosphate, Magnesium Sulfate, Cobalt Sulfate, Copper Sulfate, Iron Sulfate, Manganese Sulfate, Zinc Sulfate, Copper Proteinate, Manganese Proteinate, Iron Proteinate, Zinc Proteinate, Brewers Dried Yeast, Selenium Yeast, Natural and Artificial Flavors. Bio Mos is NOT a medication, rather a strain of yeast, and is safe for pigs, poultry, dairy, beef, aquaculture, equine, rabbits, and pets. 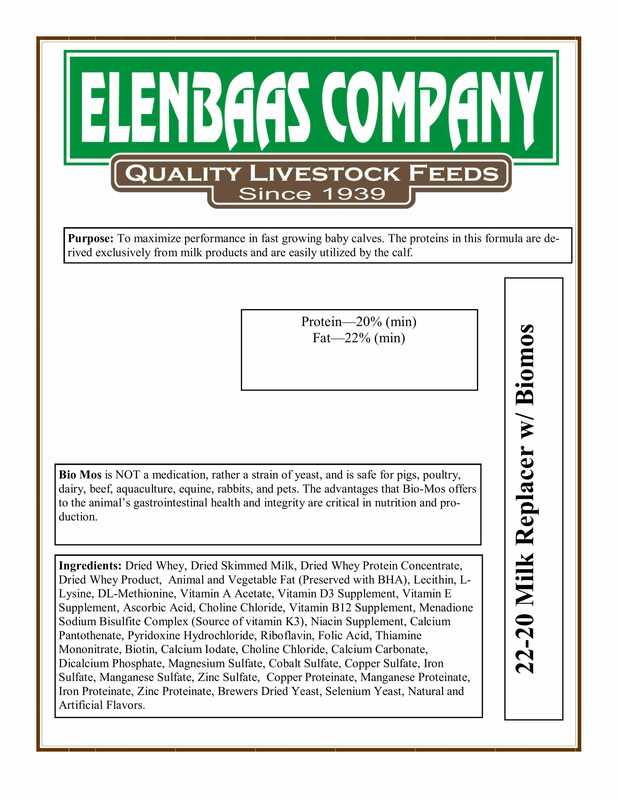 The advantages that Bio-Mos offers to the animal’s gastrointestinal health and integrity are critical in nutrition and production.